I talk to a lot of clients, potential clients, people at parties who are trying to figure out what they want to do with their careers and they want to DO IT NOW. They want to skip really important steps because they want to just figure it out right now. However they have some steps that they need to follow. I believe it every single person should start with some of the BIG “life questions” like “Why do I work?”, “What is Meaningful to me?” you know, “How do I want to be in the world?” You should start here, but there a lot of people that are just not even wanting to do those questions - they want to skip ahead. So, the next thing that they get to is “Okay, I'm going to write out a list of all of the things that I can do.” Then they write out a list of skills that they can do and they start looking at jobs that line up with the skill sets they have. While it apparently makes sense, that's actually the wrong way to go about it. I think what you need to do is organize and analyze those skills. 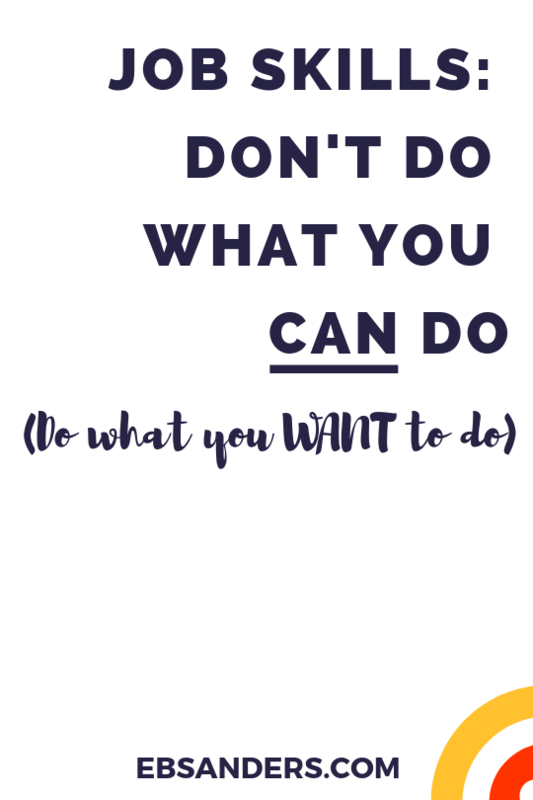 You need to take a look at not just what you can do but what you want to do. So I'm going to show you, really quickly, for those frustrated, impatient people out there, how you can you organize your skill sets in a way that makes sense for your career search and for when you’re questioning what you should do next. You're going to write some lists. Four lists (you can do this). 1. List number one: Write out ALL the skills that you have. All of them. Everything that you can do. Especially all the stuff that’s super second nature to you. You want to write that down. List every skill that you could have someone to pay you to do. 2. List number two: Write out all the skills/stuff you want to do. Now, these lists are going to look a little different right? List #1 is going to be much longer than list #2. Don’t worry about size right now , just list out all of the things that you can and want to do. 3. List number three: I think this one is just as important as list #1, but a lot of people skip it. For this list, list out all of the skills all of the things that you can do but that you do not want to do. Just because you can do something doesn’t mean you should. Let’s say you take a job that uses your top 10 can do/saleable skills, but you hate nine of them - even if you're being paid double you're going to be miserable. 4. List number four: I love this list. This is the stuff that maybe you got a chance to do once six months ago or it's just a skill that you’ve always been interested in learning, or a skill that you've been learning but haven't had much of a chance to actually use. Ok great. Now, you’ve got four lists, what do you do with them? You’re going to take your list of all the things you can do and your list of all the things you don't want to do and cross reference them. Make sure to check that off against list #2. What overlaps what is the stuff that you can do and that you want to do and made it to both lists. Essentially what’s in the middle of a Venn Diagram. That list of skills right there is what you should be plugging it into a job search engines to see what comes back at you in terms of titles, in terms of companies, in terms of roles, in terms of the fields. That's going to be where your interests lie - so look at that short list in the middle of that cool Venn diagram. Do not forget list #4! While you're on this search for your next thing, you should start learning some of the things are on that list. Take an hour and learn that new piece of software. Learn that new management skill - whatever it is. Now when looking at potential jobs, if you fulfill 80% of the requirements for a job description and you are interested in learning the other 20%... you are a perfect fit for that role. So that’s it. Four lists and a little bit of organization. This is the step that you cannot skip - so as frustrated and as raring to go as you might be... do not skip this step. This step is absolutely necessary for you to find work that's going to make you happy in the future. I promise you - just take an hour to do this it will save you a lot of trial-and-error. It'll save you a lot of headache. Also, send me a copy of your Venn Diagram I would love love love to see it! So go, give it a whirl! Are you ready to wow recruiters with how your skills are showcased in your LinkedIN profile? No? Grab your free cheatsheet “MAKE YOUR LINKEDIN WORK FOR YOU: TOP 10 RECRUITER APPROVED LINKEDIN MUSTS” and get ready to shine!